Google has overtaken Apple to become world’s most valuable brand, as per a research conducted by Marketing firm Millward Brown. The study named “BrandZ Top 100 Most Valuable Global Brands” found that Google’s brand value has shot 40% in the last one year to $158.84 billion, overtaking last year’s winner Apple. For the last three years, Apple had topped this chart, but in the last 12 months, its brand value fell by 20% to $147.88 billion. 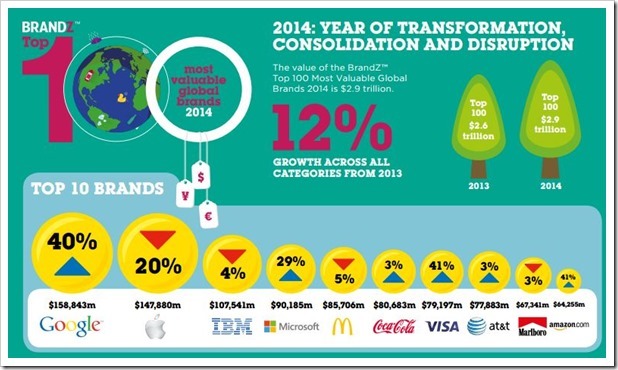 IBM was placed at 3rd position with total brand value to the tune of $107.54 billion (which has decreased 4% compared to last year), whereas Microsoft was ranked #4 with $90.19 billion brand value which is an increase of 29% compared to last year. Interestingly, world’s top 4 brands, all belong to the technology niche, followed by other niches such as fast food (McDonald at $85.71 billion), soft drinks (Coca Cola at $80368 billion), credit cards (Visa at $79.19 billion) and telecom (AT&T at $77.88 billion). The last two spots are held by Marlboro with $67.34 billion and Amazon at $64.25 billion brand value. This ranking yet again demonstrates that the technology companies are actually dominating the corporate and business world more than any other niche. What’s more, tech domain is dominating the new dictionary word additions as well! The study found out that Google is much more than a search engine, as it has transformed itself into a technology company which is impacting the lives of all those who use it’s products on a daily basis. The boost in it’s ranking for this year came with the introduction of Google Glass, which has generated quite a lot of buzz all over the technological world. World’s top 100 most valuable brands have combined worth of $2.9 trillion, which is an increase of 12% compared to last year. You can get the complete ranking of the top global brands right here. And more interesting insights and data in this infographic. "Google Beats Apple To Become World’s Most Valuable Brand. Is Apple On The Wane Now? ", 5 out of 5 based on 1 ratings.